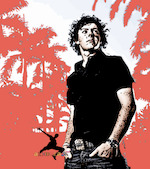 McIlroy said: “Paul is very passionate. He has been excited about the Vivendi Trophy for a while now and I think he’d make a great Ryder Cup captain. “He is very excited with the young squad he has with me and Chris Wood in there. He is just excited to be in that role and he’ll be brilliant. McIlroy, 20, and McGinley, 43, might look like the odd couple but the ISM stablemates have been pals for some time. As for McGinley, the Dubliner is massively impressed with what he has seen from the Holywood idol and reckons that Race to Dubai leader Martin Kaymer is the only young gun who comes close to match the kid he regards as the best young player in the world. McGinley said: “He is brilliant and he has got the confidence to go with it. All the hype is justified. “His game is so good and he is confident. How can you not be confident with the game he has? “He hits it over 300 yards and he's pretty straight. He putts and chips brilliantly and he plays with no fear. When you put that package together it is pretty formidable. “People always talk about Rory being the best young player in the world - and he is too. But look at Martin Kaymer and what he has achieved - think of the tournaments he has won quietly, under the radar. While the injured Kaymer will not be on Thomas Bjorn’s side in Paris, Continental Europe are the odds on favourites to beat McGinley’s weakened British and Irish team for the first time since the inaugural Seve Trophy in 2000. Padraig Harrington, Sergio Garcia, Ian Poulter, Luke Donald and Justin Rose are all missing for the holders but McGinley is excited about his chance to show off his captaincy skills. He said: “I am not going to be nervous and I am really looking forward to it. I have played under great captains in Ryder Cups and Seve Trophies and Royal Trophies. Great Britain and Ireland: Rory McIlroy, Ross Fisher, Oliver Wilson, Graeme McDowell, Chris Wood, Simon Dyson, Robert Rock, Nick Dougherty, Steve Webster, Anthony Wall. Continental Europe: Henrik Stenson, Robert Karlsson, Soren Kjeldsen, Miguel Angel Jimenez, Soren Hansen, Gonzalo Fernandez-Castano, Alvaro Quiros, Peter Hanson, Anders Hansen, Francesco Molinari. The official release says that captains Thomas Björn and Paul McGinley have announced strong teams for the Vivendi Trophy with Seve Ballesteros, with 12 players from the top 50 on the Official World Golf Ranking competing at Saint-Nom-la-Bretèche Golf Club in Paris from September 24-27. McGinley and McDowell at the Royal TrophyThe reality is that McGinley faces an uphill task following the withdrawal or unavailability of most of his top names. He'll have eight Englishmen and two Irishmen at his disposal but he's short on firepower. The score before the start - Continental Europe 8, Great Britain and Ireland 4. Rory McIlroy took the biggest scalp of his career so far when he beat world No 5 Henrik Stenson to help GB&I to a 16.5-11.5 win over Continental Europe in the Vivendi Trophy. At the start of this year, McIlroy lost to the world No 8 and eventual champion Geoff Ogilvy in the quarter-finals of the Accenture Match Play in Tucson. How far he has come in such a short space of time.